Most of you know that at De la Gente we work with coffee cooperatives made up of smallholder farmers who produce amazing coffee here in Guatemala. Many of you have joined us on a tour where you learned about how coffee is grown and processed and in doing so have developed a deeper appreciation for the immense amount of work and care behind a single pot or slurp of joe. But how many of you know how coffee makes it to your cup? It’s quite a process and we promise that once you understand it, you will only appreciate each cup of coffee more! Before our coffee can be bagged up and shipped to North America, or elsewhere, it has to be sorted to eliminate any defects (bad beans), that may affect the flavor and quality. Cooperative members, their relatives, and even hired community members do this by hand. As you can imagine, this selective process requires a good eye, a delicate touch, and takes hours and hours of work for even small amounts. 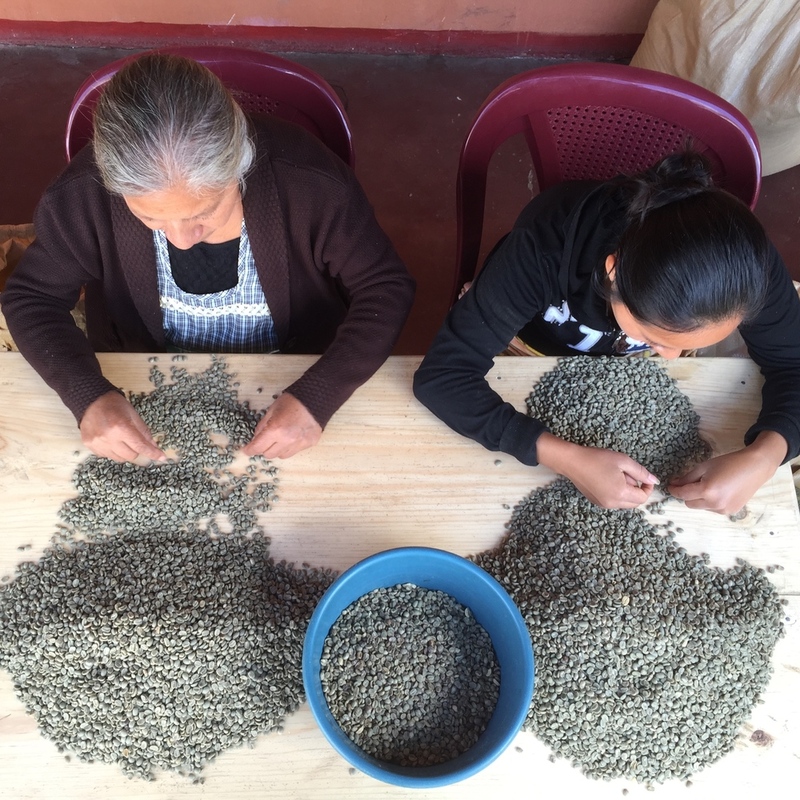 The women in San Miguel Escobar take pride in their speed and efficiency, responding with a chuckle that when it comes to coffee sorting, they are much better at it than their male counterparts (though everyone pitches in to help ensure the coffee is well sorted). Near the end of harvest season the ladies set up their tables and sit down to sort. Efficiency is key, so they have developed effective systems to eliminate defects as quickly as possible while enjoying each others company. Once each farmer’s coffee is sorted, it is checked again for quality. If it meets specialty standards that only allow minimal defects, then it is ready to be blended. Each farmer who plans to contribute to the export will bring their green coffee to the blending location where they pour out their bags into a large pile to be mixed to ensure the coffee is a balanced representation of the cooperative as a whole. This could be done with more advanced machinery in a factory, far away from where the coffee has been grown and processed... But this would mean adding another entity to the already busy supply chain, in turn, reducing the income for producers - which does not gel well with our mission. So, our farmers do it themselves. This can be quite the process when you need to mix over 35,000 lbs, in other words, not for the faint-of-heart. Needless to say, our partner producers accomplished this easily, and in less than a full days work. Each person played a crucial role, from helping to check quality, shoveling beans to better mix the lot, bagging and weighing, sewing the sacks shut, and transporting the final product to storage. Loading the container is the final step before the coffee sets off to sea. Again, rather than outsourcing the labor, the farmers do this themselves. This typically begins at dawn. For example, farmers arrived at 5:30am to pack our last shipment, which was a spectacle. 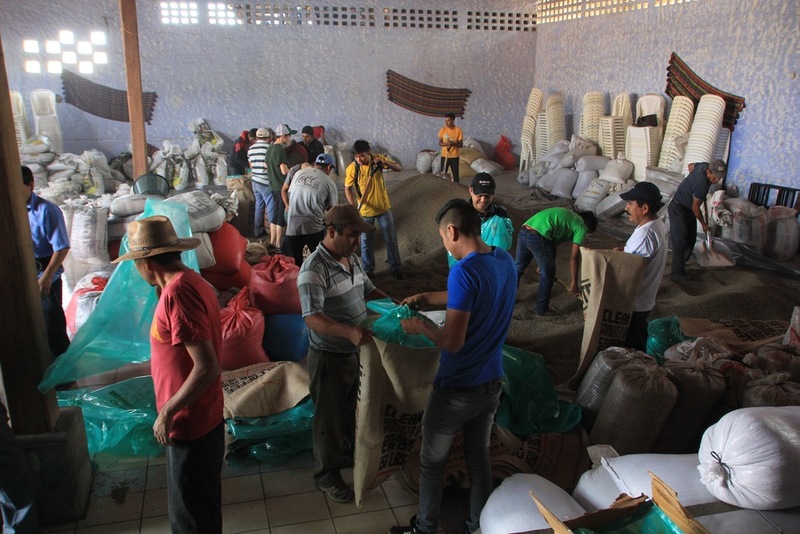 Farmers and their sons laden with 150 pound sacks, moving coffee out of the storage facility and into the container. In just 40 minutes, 330 bags, or about 50,000 pounds of coffee were securely packed. When the final bag of this final container was loaded, everyone erupted with cheers; all their work was packed and sealed for the season. At De la Gente we are passionate about working with farmers to produce the highest quality coffee possible, and to increase their income by incorporating them in every step of the chain. This year we exported over 80,000 lbs of green coffee from all five of the partner cooperatives with whom we work. This is a huge accomplishment since roya, or coffee leaf rust devastated many plantations across Central America. With our support, the hardest hit cooperatives made tremendous strides, and you will be able to purchase their coffee in our online store this summer! Our work is made possible with your support, each bag of coffee you buy gives back to the producers who work so hard to produce. As well, 100% of every donation made to DLG goes to supporting our projects like combating roya or offering best practices trainings. Make a donation today to support the farmers achieve their fullest potential or join our coffee club and have freshly roasted coffee delivered to your door every month. It's not just coffee, it's a way of life.